Welcome to the research blog. My name is Daniel Cespedes, and the goal of this blog is to examine in detail Scottish (male and female) clothing from periods of the late 17th century to the mid-18th. I have to give credit to Kyle Dalton over at British Tars for the idea of using a blog to compile research entries that are tag-able, easily searchable, and well organized. If you haven’t checked out his blog about 18th and 19th century British sailors, make sure to do so, as it is a fascinating and well-written resource. Such is the objective for these pages, and I hope it can serve to be an objective, free resource for all who are interested in the material culture of the Scots towards the latter years of the highland clan system. To start, the emphasis will be primarily on common highlanders, who seem to be mired in one of the greatest quantities of myths than most other realms of history. So here we begin with an engraving plate from Burt’s Letters from the North of Scotland, which is a fascinating (and at times, hilarious) collection of first-hand accounts Edmund Burt, who traveled to the highlands as an officer and contractor for the British government in the 1720’s. Starting with the fellow in the front row left, there are a couple of different interpretations of this depiction. On his head he wears a knit Scottish bonnet with a small crown. His coat is longer than those of his counterparts as he is not wearing the belted plaid, or feileadh mór, of his counterparts. Also on his coat are a suggestion of slashed cuffs and an outside pocket–the latter of which would be very atypical of pocket styles in the 18th century. On his upper legs could be one of three things–the skirts of a long shirt (probably wool, in the style of the Arnish Moor bog body); a kilt or feileadh beag, in a solid-color wool; or it could be an earlier style of unbound, wide-legged breeches, like those on the Gunnister bog body. He wears cloth-cut hose and square-toed tie shoes. These could also be simple pumps as no heel is depicted. It is possible he is a servant to the highlander beside him. Next in from the left is a man with all the classic styles of early to mid-18th century highland men. Bonnet, short coat, belted plaid with the extra bulk draped over the left shoulder, cloth cut bag hose (with garters, though undepicted), and shoes–these show a slight heel. This is the same basic setup for the other two highland men to the right. Neckwear appears to be absent, as do shoe buckles. Their hair is worn long and unkempt. The “kilt” or skirt part of the plaid is worn high above the knee, which was seen as fairly obscene in the eyes of their English and lowland relatives. The highlander on the far right wears the belted plaid with the upper half wrapped around his shoulders for extra warmth, a dirk, no sporran, as well as some rectangular details on his shoulders above the plaid that I can’t make out. The highlander second to the right is decked out with all the familiar accoutrements of someone with means: a musket, powder horn, basket hilted broadsword, baldric, dirk, sporran, and large pack that may be an overstuffed snapsack or primitive knapsack of some sort. It is worth noting that the dirk sheath appears to taper off to one side as opposed to being symmetrical, thereby resembling something more like a modern machete. 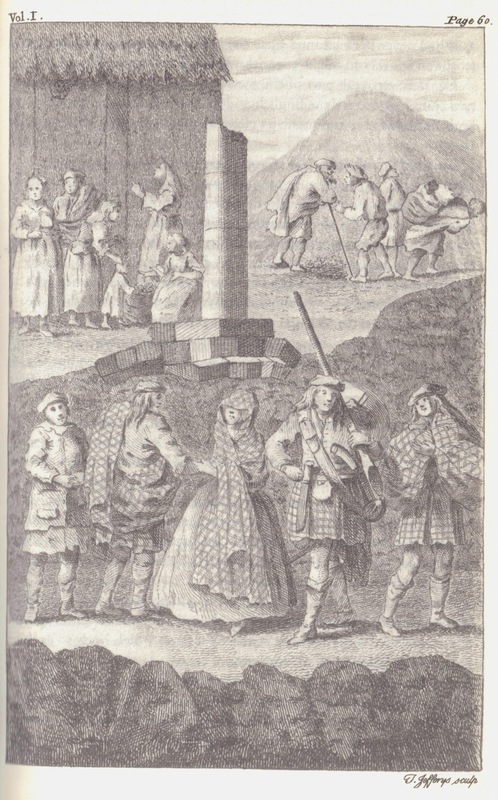 The woman in the middle wears her tartan arisaid over her head and upper body, unfortunately concealing any other details besides her wide petticoat. Brooches are absent. The highland folk in the background are less detailed. On the men we still see bonnets, belted plaids, and other clothing with a generally baggy fit. The hunched figure fourth from the right wears a beard, which was definitely a rarity and eccentricity in the 18th century. The individual third from the right could be a sailor, wearing breeches, possibly a striped neckerchief, and a hat which resembles a short-brimmed round cap more than it does a bonnet. The women in the background exhibit petticoats without visible aprons, the wearing of the ‘kertch’ on the head, and what appear to be working class bed jackets. The woman on the far left has a suggestion of shoe ties on her right foot, while others appear to be barefoot. The woman third from the left has a garment ending at her hip/seat which could be stays or jumps worn without a bed jacket over. The struggling figure on the far right has no shoes, no headwear, and just appears to be wearing a long shirt typical of the period. Well! That was certainly a dense piece to analyze, but having as few images as we do that depict common highlanders at this time in history, all the details are welcomed. Burt’s Letters, apart from being an enjoyable read, is one of the best sources I’ve come across and I highly recommend it to anyone who has an interest in Scottish highland culture in the 1720’s.